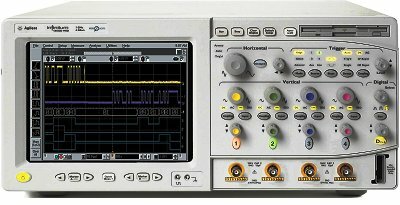 The Agilent 54831B is a versatile oscilloscope that is optimized for a wide range of applications. This mixed-signal oscilloscope finds numerous applications in the designing of high-speed digital systems. It is designed to deliver impressive performance, and is well respected for its deep memory that enables users to capture long and complex waveforms. It also employs the MegaZoom technology to provide users with responsive user-input controls and fast waveform updates. The Agilent 54831B is designed to deliver optimum resolution. This deep-memory oscilloscope offers impressive memory options that enable users to configure their scopes to capture virtually any waveform without compromising the sample rate. It offers a 600 MHz bandwidth with 4 channels, and a maximum sample rate of 4 GSa/s. The popular model blends powerful features, industry-leading specifications, and ease of use to provide users with impressive performance. Other noteable 54831B features include analog-like front panel, powerful connectivity, and a Windows-based interface. A built-in information system is one of the more popular features offered by the Agilent 54831B. This technology is integrated to enable operators to obtain fast answers to a range of questions that may arise during testing exercises. The step-by-step instructions offered by its task-oriented Setup Guide enable technicians to perform advanced measurements with speed and accuracy. The 54831B is designed to deliver excellent resolution and maximum sample rate on every measurement. In addition, the powerful oscilloscope operates at impressive speeds and offers up to 250 ps without employing any special modes. It will display peak points in darker colors, and it allows users to see richly detailed events by zooming. Learn more about Mixed-Signal oscilloscopes here. Operators can drag and drop the 54831B markers using the mouse or arrows. Its bus mode display is specially designed to allow quick readout of values in hexa-decimal representation. Its easy to read high-resolution color display is designed to deliver signals with exceptional clarity. This 8.4-inch TFT display features an anti-glare coating that allows the user to view the signal details from all angles. The oscilloscope also includes a hard drive that has a storage capacity of over 20 GB. The expansive memory is very useful for storing measurement results and set-ups. Other useful resources include its email on trigger, GPIB over LAN connectivity, and web-enabled connectivity, which allows operators to remotely access 54831B’s measurements. It is easy to store captured results when carrying out measurements using the 54831B. This allows operators to save all waveforms that are obtained from both analog and digital channels quickly and easily. In addition, this oscilloscope offers a colorful visual representation, color-graded persistence, and an intensity-graded persistence mode to enable operators to pick out anomalies quickly in many situations. It also includes powerful QuickMeas+ feature that allows users to automate up to four measurements.